Mongolia truly is the final frontier. I’ve traveled to more than 60 countries, but nowhere have I felt as remote as I have in Mongolia. It stretches across long, uninterrupted swaths of summits and steppes, a frozen land that seems to be lost in time. On approach to the airport, it becomes apparent just how vast and sparsely inhabited Mongolia is. Mountain ridge upon mountain ridge goes on in every direction as far as the eye can see. Then, a tiny sliver of human activity appears on the horizon: Ulaan Baatar. The city of Ulaan Baatar (translated as the “Red Hero”) is a relatively new settlement for a country with a thousands-year-old history. Founded in the late 17th century as Khuree, it went through several perturbations, rulers (Chinese and Soviet), and name changes until in 1924 it was named Ulaan Baatar to honor communist triumph in the nearby Soviet Union. Soviet influence remained throughout much of the 20th century. Today, the capital is booming with new construction and luxury brands are taking over the city, but the Soviet layers — and deeper still, Buddhist ones — are easily within reach. The journey through subzero, frigid Mongolia puts my photography skills to a rigorous test. With harsh winds blowing directly at me, my eyes instantly water and tears freeze as my fingers refuse to move swiftly and press the right camera button. We leave the congested city behind and set on a 1,000km trek to the north of the country. For days, nothing but a bright white patch of land embraced by the bottomless blue winter sky stretches in front of us. An old Soviet UAZik, the metal beast of a vehicle, is our trusted companion on the treacherous icy roads. To get to our final destination, Lake Khuvsgul, we head west and then we go off-road. Where a sedan would get stuck a hundred times over, the uazik forces on through hummocks and puddles and mud. I lose track of bottom and top as my insides get turned upside down with every jump of the wagon. On the way, we pass countless herds of horses, goats, and sheep grazing the frozen soil. There are 3 million people living on this land and 60 million livestock — 20 animals for every single Mongolian resident. 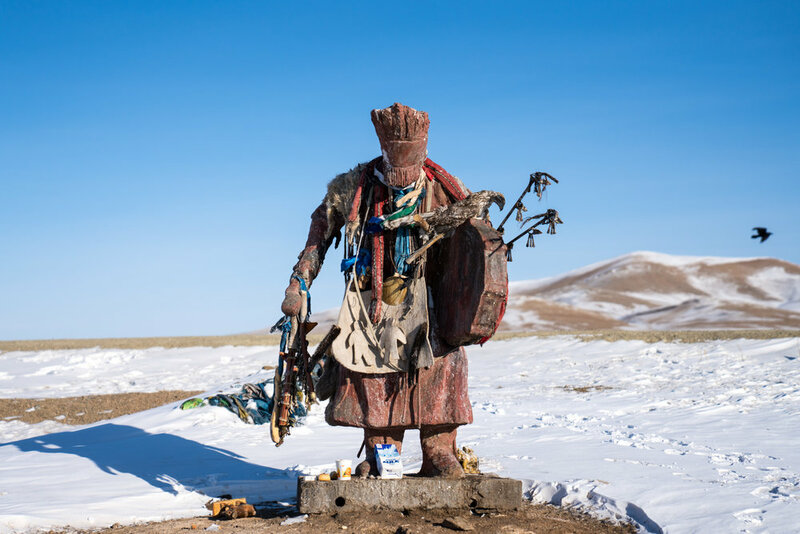 Although Mongolia is a majority Buddhist country, I observe a blend of different spiritual traditions: shaman, agnostic, Buddhist and Catholic. As we continue further into the countryside, we encounter strange, hair-raising shaman statues that look alarmingly alive. We stop frequently and walk up to the statues to offer our greetings and ask for a safe passage on. Scattered throughout the steppes, white and gray ghers show up on our route here and there. A gher is a traditional circular portable tent that consists of 88 wooden beams, five extended walls, and several woolen fabrics stretched over the structure. It takes five people one hour to put this home together. I learn that many Mongolian families outside of the cities are semi-nomadic. They continue to follow the lifestyle that hasn't changed much over the centuries. By the end of the second day, we get lost in the middle of nowhere, central Mongolia. As the sun nearly sets, we have no choice but to ask for refuge from the first soul we encounter. Guided by a teenage shepherd, we approach the nearest gher, thick smoke pouring from its tall metal pipe. The family says 'yes' to hosting us for the night and the wheels of a centuries-old tradition — to bestow a generous welcome upon an honorable guest — are swiftly set into motion. Nara, the family hostess, serves us hot tsai, black tea brewed with buffalo milk and a dash of salt on the gher's impressive firewood hearth. Before the last cup is poured, Nara places a large vat filled with water on top of the stove. We are lucky to catch the tail end of the Lunar New Year, which means that vodka and horse meat dumplings are on the menu. Life in a gher is tough. There is no running water; heat comes from a wood stove; electricity is provided by a solar-panel battery. Despite these difficulties, the people I meet on this journey seem to be incredibly content and present, welcoming us with a genuine smile and a light touch. Before long, neighbors from nearby ghers gather round — they don't get many visitors. We share more tsai, vodka, and dumplings that night and I glimpse into a life that is unimaginably different from my own. The next day, we press on towards the lake in Northern Mongolia where Tsaatan nomadic reindeer herders gather once a year to celebrate their traditions. Tsaatan nomadic reindeer herders gather on Lake Khuvsgul once a year to celebrate their traditions. Sister lake to the famous Lake Baikal in Russia, Northern Mongolia's Lake Khuvsgul is in the state of deep freeze from November to May. The thick ice is safe enough for people to walk, jump, run, bicycle, drive, drift, skate, sleigh, have picnics, perform shaman rituals, and ride horses on the lake. Once a year, Mongolians from across the country gather here to do just that — all while enduring frigid temperatures that don't spare the extremities. I cannot believe that beauty like this exists, largely unexplored. The remoteness of Lake Khuvsgul ensures few travelers have ever laid their eyes on this blue pearl of Mongolia. I think back to my favorite memories of this physically grueling trip. The people I've met in Mongolia are welcoming, kind, optimistic. They laugh a lot and, if you have the honor to be their guest, will throw you a feast with everything that they have placed at the table. Going to the end of the Earth and back, I discover once again that connecting with warm, generous people is travel's biggest treasure.